In this posting I will discuss some special jams that normally we do not prepare at home since these fruits are not available in good quality here. We can use for this black berry, blue berry, Boysen berry, dew berry, gooseberry, Logan berry, raspberry and young berry. 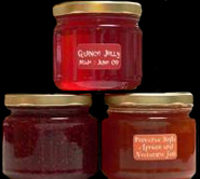 Individually or in combination jam can be prepared. Wash the berries, cool dry and crush. If you do not want the seeds to be included, cook the berries till they become soft, press them through a sieve and collect the extract. Add sugar to this and heat. Keep stirring. Let the sugar dissolve. Add citric acid when the mixture boils. Keep stirring till the contents thicken. If the berries taste sour then no need to add citric acid.Select the essence and colour as per the berry you use. 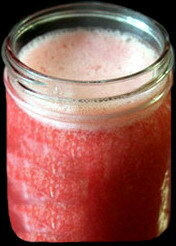 For instance raspberry is pink as such you need pink colour and raspberry essence. In the case of mixed berries (normally straw berry, rasp berry and clack berry are combined to make triple berry jam), the essence also should be a combination of essences of those berries. Colour in this case may be anything but normally red or brown colour is chosen. When the mixture does not stick to the side and is thick put off the fire. Add the colour, essence and Sodium Benzoate after its temperature becomes warm. Mix well. When it is cool, fill up the bottles and close with airtight lid after it is completely cool. Allow 1″ head room below the lid for expansion. In case after a day or two if you think that the jam is thinner, you can re-boil it adding pectin (See previous posting for using pectin as well as the details on the packets of pectin powder). Wash the figs and cool dry them. Blanch in hot piping water. After 10 minutes, drain the water. 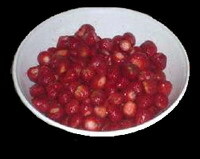 Remove the stems, if any and chop the fruits. Add some water and sugar. Heat stirring constantly. Let the sugar dissolve. Add citric acid when the mixture boils. Keep stirring till the contents thicken. When the mixture does not stick to the side and is thick put off the fire. Add the colour, essence and Sodium Benzoate after its temperature becomes warm. Mix well. When it is cool, fill up the bottles and close with airtight lid after it is completely cool. Allow 1″ head room below the lid for expansion. In case after a day or two if you think that the jam is thinner, you can re-boil it adding pectin (See previous posting for using pectin as well as the details on the packets of pectin powder). Wash the peaches and cool dry them. Peel and crush. Add some water and cook gently. Add sugar. Slowly bring to boiling. Keep stirring constantly. Let the sugar dissolve. Add citric acid crystals if the peaches are not sour. Stir till the mass does not stick to the side and becomes thick. Put off the fire. Add the colour, essence and Sodium Benzoate after its temperature becomes warm. Mix well. When it is cool, fill up the bottles and close with airtight lid after it is completely cool. Allow 1″ head room below the lid for expansion. In case after a day or two if you think that the jam is thinner, you can re-boil it adding pectin (See previous posting for using pectin as well as the details on the packets of pectin powder). 1. In the case of straw berry, remove its hull and in the case of others, the stem and leaves if any can be removed. 2. Normally deseeding is not done and berries are just crushed and used directly. However, in the case of blackberries you can cook and press through a sieve. 3. Remember to remove the foam forming on the surface when boiling as it may spoil the jam. Some people add a teaspoonful of butter before boiling to reduce the formation of foam. 4. Sometimes the fruits may float after the jam is made. This is due to less sugar. Hence the quantity of sugar is to be adjusted. That is why I advise to try any recipe in a small quantity for trial and by trial and error method, you can perfect the product. 5. In the west, they make the jams spicy by adding cinnamon, cardamom, clove etc powders by tying these in a neat muslin cloth and dropping while the jam is boiling. This bag is removed after the jam is removed from the fire. This entry was posted on March 29, 2012 at 5:17 pm and is filed under Jams, Morabbas, Squashes and Sauces with tags Berry jam, citric acid crystals, essence, Fig jam, food colours, Jam, Jelly, Morabba, Peach jam, pectin, potassium metabisulphite, sauce, sodium benzoate, squash, sugar. You can follow any responses to this entry through the RSS 2.0 feed. Both comments and pings are currently closed.